WOOT! 29 weeks today and just TEN WEEKS until c-day! I cannot believe it! I know I say it every week but it truly is flying by! Okay! So! 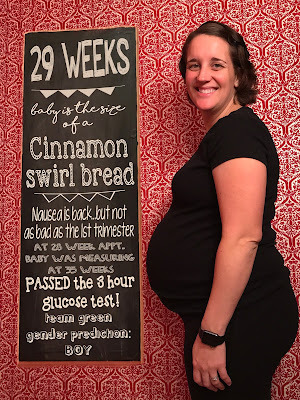 Let's recap the past week: I had my 28 week appointment at my OB and everything looked good! Except my gigantic belly is measuring at THIRTY.FIVE.WEEKS. EEKKKK! So I have an ultrasound scheduled for next week at my 30 week appointment to check size and fluids. I already know this kid is huge (at my 25 week ultrasound he/she was measuring in the 89th percentile!) so I am oh-so-curious to see where he/she is next week. Gestational diabetes...I had my one hour test for this last week at my 28 week appointment and dammit. I failed it again -- just like last time with Rosie. And I didn't fail by much -- you needed a 135 (or 140? I can't remember the exact cutoff) and I got a 144. UGHHHH. Next kid I'm just asking for the 3 hour one right off of the bat to skip this failing the one hour one nonesense (which apparently like 70% of people fail their one hour?!! HELLLLLLOOOOO! Something's probably broken with that test people!) So I had to take off school on Friday cause they wanted me to do the 3 hour one ASAP. I did that one Friday morning (holy boring, sitting in the doc's office for THREE HOURS doing absolutely nothing -- although I did make a dent in the book I'm reading) and then had to wait all weekend for my results, again prepping myself that I failed and have gestational diabetes. On Monday morning I logged into my doc's app and saw my lab results and I PASSSSSSEEEEEDDDD! With flying colors even -- not even close to the cut off numbers...so once again, just like with Rosie, I failed the 1 hour test but passed the 3 hour no problem! Woo hoo! Thankfully I didn't wait all day for the nurse to call cause um, they never did! Guess no news is good news from them! I did have to take a half sick day on Monday thought cause of a nasty stomach bug. Not my favorite day. So! Onto other pastures...Patrick has ALWAYS SAID this kid is a girl. However, now when you ask him he says it's a little brother (who we should name Pickles! haha!) andddddddd as FIRM as I've been on my gender prediction being a girl, I'm switching it up this week and thinking blue. 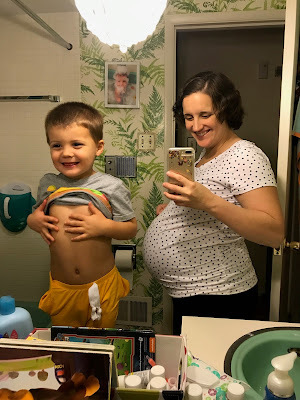 Everything to me still points girl, and maybe it is, but Patrick's new thoughts AND how gigantic this kid is measuring kindaaaaa makes me think boy. So! This week I'm predicting boy! And I'm betting it'll change 10 more times before he/she comes. Haha! As far as how I'm feeling, I'm definitely this past week feeling like I'm much bigger and farther along than just 29 weeks! I've been having some pelvic pain (lovely, I know!) where it feels like I've been socked in the lower gut ALL.THE.TIME. And then couple that with the constant feeling of needing to pee! Gahhh! Nausea has returned, but not like the first trimester (or heck, first 17 weeks!!) was, so I can't complain too much -- it comes and goes and fortunately is going more than coming lately. But other than that, no other aches or pains (no backaches or anything! Woot!) so I can't complain tooooo much. But felt like it needed to be noted! So! That's all I've got for week 29! Thanksgiving is Thursday (whattt?!! already?!!) and I seriously cannot believe how fast this year has flown by -- especially this pregnancy. NUTS. Anyways, until week 30 (!!!) friends, adios! Overall mood? SO EXCITED! 10 weeks to go! 2017 is Gonna Be GREAT!